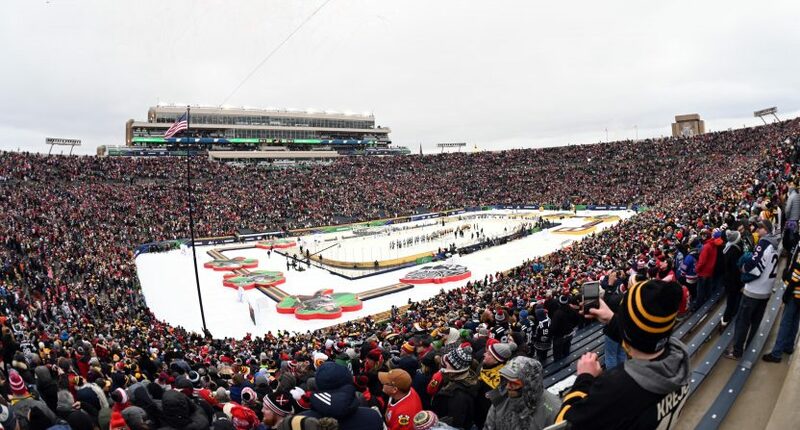 The 2019 NHL Winter Classic was a memorable contest between the Chicago Blackhawks and the Boston Bruins at Notre Dame Stadium. While the headlines were dominated by food running out at the stadium and the Blackhawks losing yet another outdoor game, the league enjoyed a slight uptick in television ratings with their best mark in four years. Once upon a time, the Winter Classic was a must-see event. Serious, casual and even non-hockey fans made a point to watch the NHL play outdoors. The Winter Classic felt like something special and unique. Unfortunately, that’s no longer the case. The increase in outdoor games, the repeated use of the same teams and a lack of innovation has watered down the Winter Classic experience. Even with their best ratings mark in four years, the league is still attempting to recover from a steep drop that started years ago. What can the NHL do to right the ship? How can they make the Winter Classic their marquee event once again? The easiest and quickest solution is to feature different teams as soon as possible. As fun as it has been to watch the Blackhawks lose Winter Classic after Winter Classic (they’re now 0-4), it’s time for something different. The NHL is already moving in that direction by calling on the Dallas Stars for the next Winter Classic, but they need to avoid falling back and once again calling on their usual participants. Through 11 Winter Classic games, eight teams have participated two or more times. That’s absurd. Meanwhile, ratings have proved to be decent in markets beyond the stereotypical ones. Check out Las Vegas. Boston led all markets for yesterday’s Winter Classic with a 7.9 rating, third-best for market for a regular-season game on NBC. Providence was second with 6.5 rating. Chicago delivered a 5.8 local rating. Buffalo, Hartford, Las Vegas tied for fourth with 3.4 rating. NBC will want a team from a major market in the hopes of big ratings, but wouldn’t it make more sense to grow the overall base by featuring teams people haven’t seen ad nauseam? This is another area where the NHL is improving, but why not bring the game outside in some of the most unique locations in North America? The league has proved that they can pull off outdoor games in warmer climates. That should open up some great venues (imagine a puck making it into McCovey Cove at AT&T Park) where the venue itself is worth talking about. CenturyLink Field would be another great venue that the NHL could explore once the new Seattle franchise debuts. Beyond those, the NHL could throw a curve ball and try something totally off the wall. Imagine a game in Central Park or in an outdoor location that doesn’t fit the traditional stadium mold. Now those would get people talking. The idea is more than feasible, but the desire for the largest crowd possible may overwhelm the most innovative ideas. Creativity could and should be used instead of falling back on what’s the easiest, largest or most convenient stadium. No, we’re not advocating for the return of the glowing puck. That ship has thankfully sailed. We are asking for the NHL and for its broadcast partners to innovate for the Winter Classic. Beyond a couple new camera views, one being the overhead view which is often ridiculed for being a bit nauseating, the broadcast doesn’t do enough to go outside the box. The idea of increased technology is an area the NHL is moving towards in the form of puck and player-tracking technology. But why not roll out one or two new features for the Winter Classic? Consider it a testing ground in a real-game scenario that is already taken with a grain of salt thanks to the outdoor conditions. The NHL and NBC should roll out all the stops for what is described as the league’s marquee event. Jeremy Roenick dancing isn’t going to cut it. The Winter Classic already features vintage uniforms by the teams competing. But why stop there? Why not make one Winter Classic the one that celebrates 1960s hockey? Or one that celebrates the ’80s? Go all the way with the idea with the broadcast embracing the technology and looks of the day. Or try some other sort of theme. The NHL loves to sell rivalries and history, but it rarely goes all the way in execution. This is another area where creativity could go a long way in getting viewers to tune in. Avoid being too cheesy and you may have a memorable broadcast. The NHL saw a very good thing in the Winter Classic. They also saw a very profitable thing. That led to the creation of the Stadium Series and additional outdoor games beyond the Winter Classic. As more and more outdoor games were played, the Winter Classic started feeling like less of a special event and more of a “been there, done that” event. The league needs to avoid the temptation of putting on more than one or two outdoor games each year. The Winter Classic in the United States and the Heritage Classic in Canada should be where the outdoor games begin and end each calendar year. Stop watering down what was one of your best ideas. Ultimately, the Winter Classic should focus on hockey and the game being played. But, if the league is going to try and offer some live entertainment, they could at least book acts that resonate with modern audiences. Weezer played the 2019 edition, which admittedly could have been worse. However, previous choices such as Nate Reuss, American Authors and the Goo Goo Dolls suggested that the NHL might be stuck in a different musical era. The NHL has been historically dreadful when it comes to picking entertainment. Though things are improving, they still have a long way to go. The NHL has routinely sold the Winter Classic as the end-all, be-all hockey event. That doesn’t work out too well when similar versions of the idea are held about a month later and then when the same idea is pushed during the playoffs. The league needs to know what the Winter Classic is and what it isn’t. The Winter Classic is an amazing experience for hockey fans and non-hockey fans to experience in person. And that may be the key to all of this. The event is the best when it’s viewed by those in attendance. Watching on TV can edge on annoying if you’re just hoping to see a hockey game without all of the talking heads, hype and unnecessary broadcast segments. Market the game as it is and start trying to fix what isn’t working. There’s no use pretending the Winter Classic is a bulletproof idea when key metrics suggest there’s room to improve.